Vehicle bonnet netting is perfect for securing lightweight bags or equipment to the outside bonnet of Defenders and 4x4 vehicles. They are ideal for use by competition and off-road users and on mountain rescue vehicles, safari and expedition vehicles. 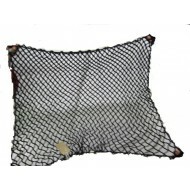 The nets are hardwearing and durable and will help to ensure that equipment stowed will remain secure and in place when you need it. This robust net is elasticated therefore ideal to store recovery straps, winch cables and other items, as it will adapt to the load volume and dimension. The net is usually secured with 4 plastic heavy duty hooks (one on each corner) which fit onto hook fixing rings which secure the load and protect the paint work of the vehicle. 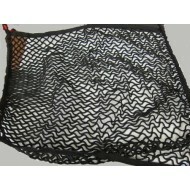 This high quality vehicle bonnet netting is perfect for securing lightweight bags or equipment to th..